Scott Loach makes a save. 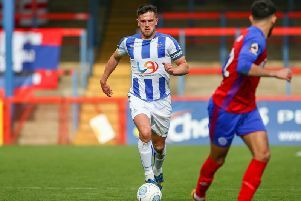 Hartlepool United’s players want to prove to new owner Raj Singh that caretaker manager Matthew Bates is worthy of the job on a permanent basis – and also secure their own futures at the club. Singh was announced as the club’s new owner on Saturday, just before the home game against Solihull Moors. Pools couldn’t take advantage of the feelgood factor, as they slipped to a late defeat at Victoria Park as Solihull scored an 88th-minute winner to spoil the party. it was the second game in succession that Hartlepool had lost late on against a team fighting against relegation, and it put a dent in Bates’s hopes of securing the manager’s job on a full-time basis. However, having steered the club to the verge of safety with three wins and two draws last month, and winning the National League’s Manager of the Month award for March in the process, Bates has signalled his ability to handle the hotseat. Now, goalkeeper Scott Loach says he – and the rest of the squad – want to finish the season strongly to impress Singh and new director of football Craig Hignett, and show that they and Bates can be the right partnership for the following campaign. “It will have a positive impact,” said Loach about the takeover. “But we want to get the job cemented for Batesy if we can. “We want to go away for the summer and know what’s going on. “There are a lot of lads who want to be here and build and learn from this season and go again next season. Two defeats in a row has meant Pools aren’t quite safe just yet, though they remain seven points above the National League’s relegation zone. Loach insists the players haven’t had their mind on their holidays after successive wins over Barrow, Bromley and Maidstone. And he says they need to finish the job off before looking ahead to the summer break. Loach said: “I don’t think we thought we had it done, because football can change quickly. Pools travel to Sutton United on Saturday and are expected to be backed by another strong travelling horde. Hartlepool haven’t given their loyal supporters much to cheer about on their long trips around the country most of this season, but Loach thinks that is slowly changing after the wins at Barrow and Maidstone and a draw at Fylde. He added: “The fans have been brilliant all season, they’ve travelled in their numbers, but since Aldershot away there’s definitely been a change. “Since Batesy came in, we’ve upped our game, we’ve played better. “We’ve got to give them something to cheer about. “It has been a lot better, they’ve been a 12th man. “They’ll travel to Sutton in their numbers but we’ve got to give them a reward in the last two home games.